It is fifty years since the Bertrand Russell Archives were purchased by McMaster, and in the coming year this significant anniversary will be marked in a number of ways by the Bertrand Russell Research Centre and the University Library. 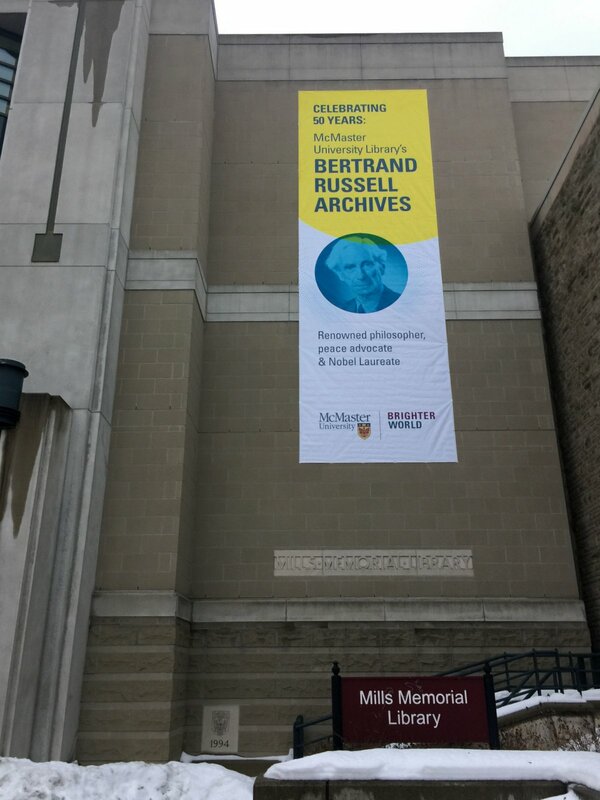 The most notable aspect of the celebrations will result in a lasting institutional change, which should greatly raise the profile of Russell studies at McMaster and the Library’s Russell collection. Both the Centre and the Archives are to move from their current premises in Mills library into a custom-renovated, former residential home near the main entrance to McMaster campus. The construction work is already under way. The formal opening of what promises to be a superb shared facility (as yet unnamed) has been planned to coincide with the 2018 Annual Meeting of the Bertrand Russell Society, which this year will convene at McMaster (22–24 June). The call for papers can be viewed here. From 19–21 June 2018, immediately before the BRS meeting, the annual meeting of the Society for the Study of the History of Analytical Philosophy (SSHAP) will also take place at McMaster. Among the invited speakers is BRRC director Nicholas Griffin. A particular emphasis at the BRS meeting will be placed on Russell’s wartime imprisonment in Brixton Prison in 1918, and in recognition of this important centenary the Russell Centre is preparing a scholarly, electronic edition of Russell’s 100-or-so “prison letters”. Kenneth Blackwell, who is closely involved with this enterprise, has also been working on a facsimile-style edition of the commonplace poetry book that Russell shared with Lady Ottoline Morrell, and which contains his own transcriptions of many favourite poems. Another notable publishing project, scheduled to appear in the spring, is a special “Russell” issue of the online Hamilton Magazine, which is being prepared under the guest editorial hand of Rick Stapleton, Archives and Research Collections librarian at McMaster. The 2017 Annual Meeting of the Bertrand Russell Society was held at Central Connecticut State University, New Britain, from 2–4 June. A panel discussion of Principles of Social Reconstruction marked the American centenary of that work’s publication, and there were presentations (among other topics) on Joseph Conrad, Hume, Russell’s logic lectures in China, and his attendance at the 1935 International Congress of Scientific Philosophy in Paris. The conference concluded in characteristic fashion with a “master class” chaired by former BRS president Alan Schwerin, which this year was devoted to Russell’s conception of vagueness. Tim Madigan and Peter Stone were announced as winners of the BRS Book Award for 2017, for their edited collection Bertrand Russell, Public Intellectual (2016). The most recent Russell is the summer 2017 double issue devoted to Russell’s writings on Leibniz, with contributions by Richard Arthur, Nicholas Griffin, Jolen Galaugher, Kenneth Blackwell (the journal’s editor), and two texts by Russell himself (both introduced by Griffin). The Spring 2017 issue of the Bertrand Russell Society Bulletin included Nancy Doubleday and Hans Loewig (until recently an undergraduate research assistant to BRRC) on Russell’s educational thought, and Tom Riggins on “Bertrand Russell’s Impressions of Soviet Russia”. Sheila Turcon’s series on Russell’s homes continued with a look at Amberley House, the Oxford address at which he and Patricia (and Conrad) lived for the year immediately preceding their departure for the United States in September 1938. This was the last issue of the Bulletin to be edited by Michael Berumen (many thanks Michael) and also the last to be available in print as well as in digital format. Editorial responsibilities have been assumed by William Bruneau, who oversaw the completion of the exclusively digital Bulletin in the Fall of 2017. This issue contained articles by Gregory Landini on the Barber’s Paradox and Carrie Jenkins on happiness, while Sheila’s tour of Russell’s houses continued with a survey of his peripatetic existence in the United States from 1938–44. Ray Perkins assessed the present level of the nuclear threat, while Carl Spadoni discussed the “CND” volume of writings that he is co-editing for the Collected Papers, and Ken Blackwell talked about the many revised editions of Russell’s books. Recent publications of note in the field of Russell studies include: Samuel Lebens’ Bertrand Russell and the Nature of Propositions: A History and Defence of the Multiple Relation Theory of Judgement, and Bertrand Russell’s Life and Legacy, edited by Peter Stone. Peter was also guest editor for a special “Russell” issue of Philosophy Now (June/July 2017). For a more complete listing, with bibliographical details and including forthcoming titles, see here. The visiting Russell scholar in the Department of Philosophy at McMaster University for 2017–18 is Dustin Olson of the University of Regina, who did his MA at McMaster. The student research assistants at the BRRC at present are Geneva Gillis and Graeme Lavender. Many thanks to Hans Loewig, for his recent and valuable contributions to work in progress on both the Collected Letters and Collected Papers projects. Page maintained by Arlene Duncan. Last updated 17 January 2018.